The month of January is when gyms make their yearly profits; that’s when most people join up. But if everybody that joined went regularly, the gyms would be bursting at the seams, unable to fit everyone in. January is when we have an internal spring clean: we promise ourselves that this year, things are going to change, we will get fitter and eat better. Statistically it’s unlikely you’ll keep going to the gym but you can at least boost your fruit and veg intake by eating salad. Salad in winter? Brrr. But actually it really hits the spot. The lack of sunlight, more time spent indoors, and low-level Seasonal Affective Disorder leads your body to crave the vitamins present in fresh raw food. Use winter salad ‘leaves’: endive/chicory both red and white, and cabbage. Grate roots and bulbs in there too: fennel, celeriac, radishes and carrots. They last for ages in the fridge bottom drawer and, even when made up and dressed, do not get ‘burnt’ as the French call a soggy salad, for you can eat them the next day. I made this first for a Scandinavian supper club, it’s a kind of slaw. The juice of whatever leftover citrus you have in your fruit bowl: I used 1 lemon and 1 grapefruit. 50ml Good pumpkin seed oil. 1 tablespoon of Maldon salt, some in the dressing leaving some to sprinkle on top last minute. 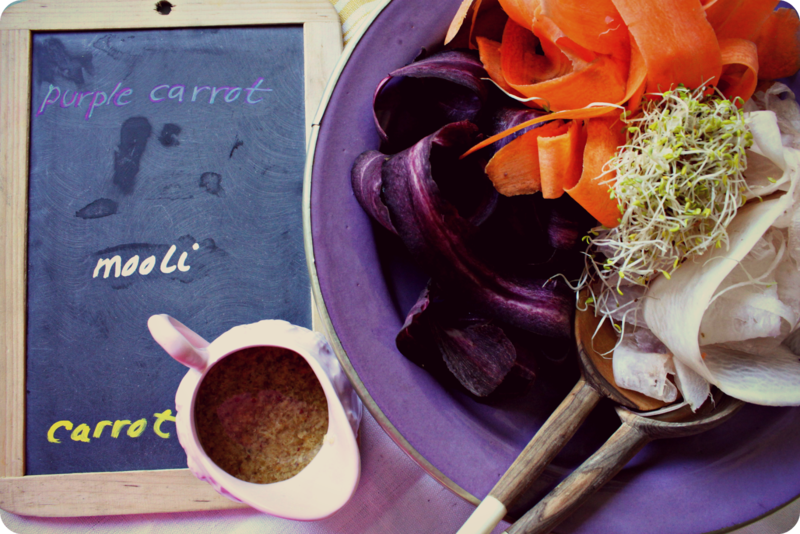 The aniseedy flavour of fennel and the sturdiness of the root make for a refreshing winter salad. 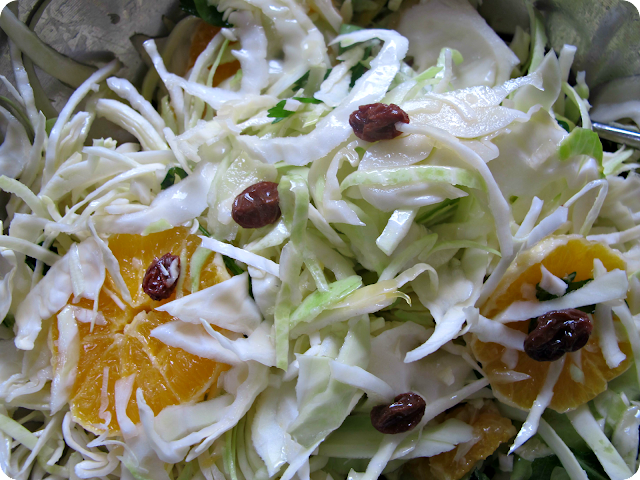 You can also make the classic fennel, orange and black olive salad tossed with your favourite vinaigrette. 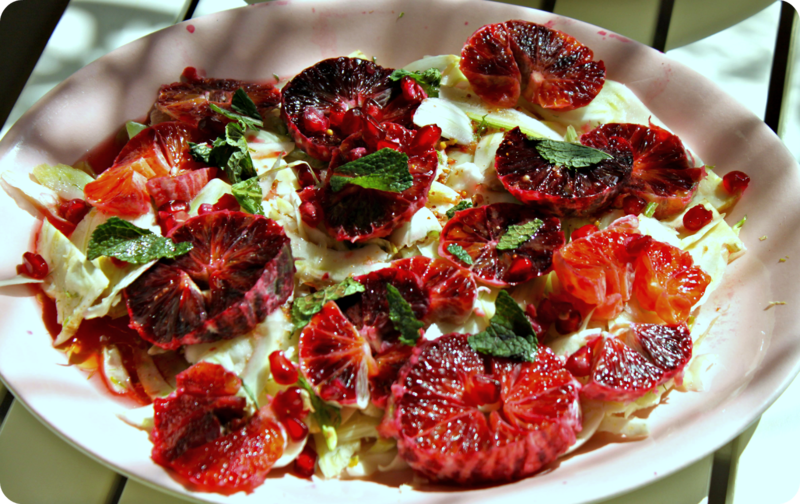 Layer the fennel on the bottom of the plate, then the circles of blood oranges, then the mint and pomegranates. Add the dressing immediately and let the fennel soak up the dressing before serving. 1 tablespoon of Maldon salt. By this I mean the bullet shaped buds of leaves rather than the curly bitter lettuce. Unfortunately it’s a ‘faux amis’ in terms of language: the French call our chicory ‘endive’ and our endives ‘chicorée’. The British don’t use endives much (partly because it’s quite expensive to buy) but it’s a staple on the French table during winter, either as a salad or baked in a white sauce, each endive wrapped with ham. This year The Secret Garden Club is going to have a go at growing some forced endives, Belgian stylee. Endives/chicory can come blanched (for they are grown underground without light) or in red. When buying white endives, note that the paler the leaves, the less bitter the taste. Health note: we all need to eat more bitter tasting foods. Bitter is best. 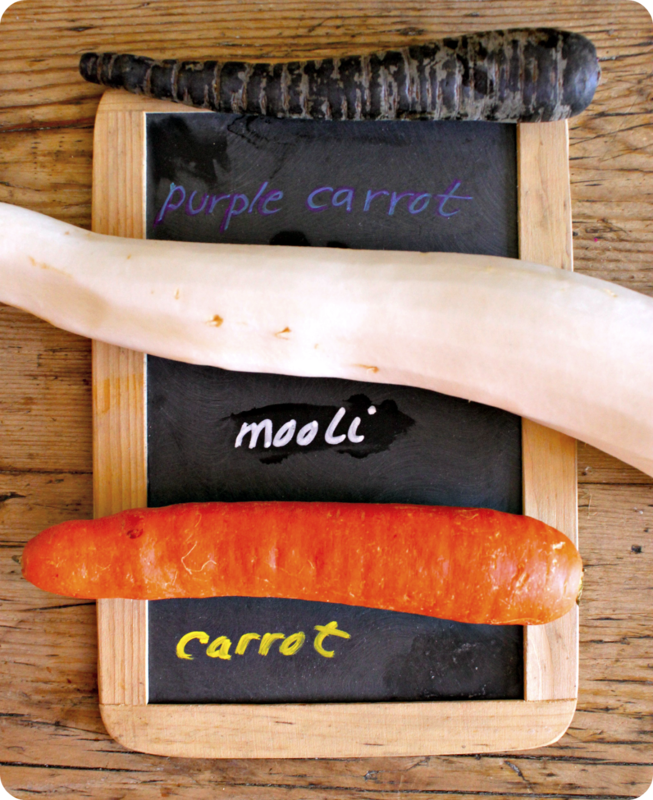 Dressing: you can either go creamy (creme fraiche, more roquefort, garlic and olive oil) or use your normal dressing. I like to experiment with different oils so I think a walnut oil would be lovely with this. 1 tablespoon of Maldon sea salt with some leftover to sprinkle over the salad last minute. I mixed black or purple carrots, orange carrots and mooli/daikon for colour, crispness and taste. Whip this up until it forms a mayonnaise style dressing. Mix ingredients together, adding the alfalfa sprouts on top. Some great colours and visual appeal in those salads! I'm going to be pedantic and correct you on something though: Maldon sea-salt, not Malden. 🙂 I guess this would be important if you lived in Maldon. I'm a great fan of both Endive and Radicchio, both of which I grow every year. Endive, walnut, Roquefort – what a fab combination. Thanks Mark, I'll correct that. I'm very sluggish after the holidays. Lovely collection of salads – am a big fan of salad all year round, just needing to change the ingredients to match the weather. 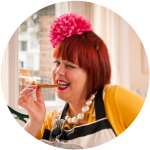 Thank you – some really great ideas, has inspired me, especially as I got a food processor for Christmas! Bron: me too, I'm often too lazy to make them but I totally love salads. Sarah: fantastic. It makes everything so easy.